New York Democratic Rep. Alexandria Ocasio-Cortez and allied progressive groups are ramping up their push for a Green New Deal. The initiative came to national prominence after Ocasio-Cortez joined young activists from the Sunrise Movement at a protest in then-Minority Leader Nancy Pelosi’s office during orientation for incoming House freshman last year. Movement leaders do not agree on a price tag. Estimates run in the hundreds of billions of dollars, or more. But they argue a combination of tax hikes on the super wealthy — Ocasio-Cortez has floated a 70% rate on income over $10 million — and cuts to fossil fuel industry subsidies and military spending, in addition to the stimulative effects of the new public spending would offset any cost. As part of the new outreach, organizers will train volunteers — online and in-person at a series of events this spring — to more effectively confront elected officials and ask for their support. The “Road to a GND Tour” was drawn up as a traveling pressure campaign designed to secure the support of political leaders, from mayors and city council members to federal lawmakers, around the country. The idea of a Green New Deal has, in just a few months, become a central piece of Ocasio-Cortez’s agenda and attracted the attention of ambitious national Democrats. Those efforts are also now slated to include a large scale demonstration outside one of the first Democratic presidential primary debates, where Sunrise organizers are hoping that thousands of young activists will gather to demand the candidates onstage back the program. So far, Sens. Bernie Sanders, Jeff Merkley, Kamala Harris, Elizabeth Warren and Cory Booker have — to varying degrees — offered their support. Ocasio-Cortez’s efforts on Capitol Hill have so far met with mixed reactions from even liberal lawmakers. 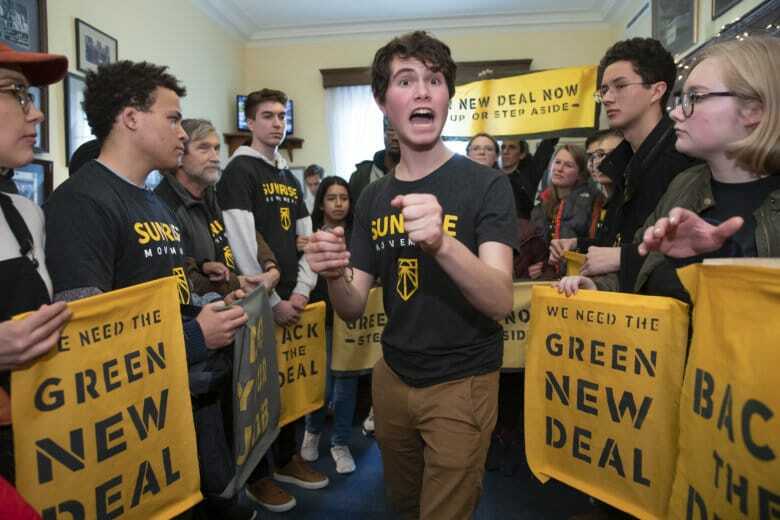 Her request to establish a committee specifically focused on developing and advancing a Green New Deal mostly fell flat with Democratic leadership, which has instead empaneled a Select Committee on the Climate Crisis to be chaired by Florida Rep. Kathy Castor. Castor came under fire from climate activists and some progressive Democrats after telling E&E News in December that she would not deny seats on the panel to members who had accepted donations from the fossil fuel industry, calling it a “First Amendment” issue. She has since backed off that position and pledged, in a subsequent interview with Sludge, to forswear those contributions herself. But the committee is not expected to have subpoena power, a sticking point with progressives who want the authority to compel energy executives to appear under oath. Sunrise, along with Ocasio-Cortez and the Justice Democrats, are concerned that the committee itself is not committed to addressing climate change issues over the 12-year timeline addressed in the detailed and dire October report from the Intergovernmental Panel on Climate Change. In response, they are also threatening to launch or back more aggressive primary challenges in 2020 to Democratic members who oppose or stay silent on the Green New Deal.